Federal 90 calendar days after expiration. Federal Pass-Through 45-60 calendar days after expiration. Other (e.g. State of Alaska) See contract - deadlines vary and may be earlier. The reporting requirements of sponsors vary. Some require semi-annual, annual or one report at the end of the project period which could cover several years. Therefore, it is advisable that the PI and the department continually monitor each award to ensure spending is consistent with the budgets for each reporting period as well as other terms and conditions of the award. However, collaboration with the department to keep projects clean and less problematic at time of reporting is certainly encouraged. Failure to submit reports by the deadline can result in suspension of the PI and/or University from receipt of additional funding, reimbursement for current costs, and ability to submit future proposals. University closeout policies and procedures were developed to ensure that all sponsor requirements are met in accordance with Uniform Guidance (2 CFR § 200.343) standards. Proactive steps should be taken prior to the award end date to prepare for the deadline. Such activities involve the combined effort between the PI, the Department/Unit Administration and OGCA. To ensure timely and accurate closeout of the award, standard communications will be sent to the PI and Department/Unit. If there are other matters related to close-out or if the principal investigator/project director needs guidance, these matters can be discussed before the official end date of the project. The University has an obligation to ensure timely fiscal compliance with Sponsor and University's policies and guidelines. It is essential that collaboration from Principal Investigators, research administrators of the administrating unit, and support from other business unit(s) takes place as appropriate. Understanding the shared responsibilities to financially close out funds is critical to effective and timely fund closeout. 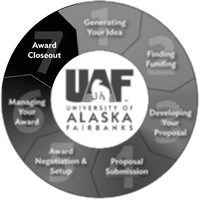 The Principal Investigator is responsible for complying with award specific terms and conditions, including the submission of programmatic/technical reports with a cc to: uaf-closeout@alaska.edu. The Unit Business office/Department is responsible for ensuring that all financial transactions are properly recorded in a timely manner to be in compliance with Sponsor’s and University’s policies and guidelines. If there are expenses which have not been posted to the general ledger but are pertinent to the award being closed, it is the responsibility of the department to bring this to the attention of OGCA and provide the supporting documentation so that OGCA’s reports and invoices can correctly capture all costs associated with the award. Review all costs for allowability and allocability. Ensure all costs have been reviewed by the PI. If no cost extension/budget extension is necessary, request via the Award Request Form (AwaRE). Assist PI/Unit Business Office with determining specific sponsor and/or award closeout requirements. Notify PI/Unit Business Office of upcoming closeout on federal awards. Review and approve invention statements as Institutional Authorized Official. If your project results in a patentable invention, OGCA will assist with the coordination of documents with OIPC to ensure the necessary reports are completed and submitted. OGCA will coordinate with the PI/unit business office and the Property Office if a final property and/or equipment report is required.